“We had no idea what we were doing,” Lynn Wannop admits to me bluntly, brushing back her auburn hair and adjusting her funky glasses. 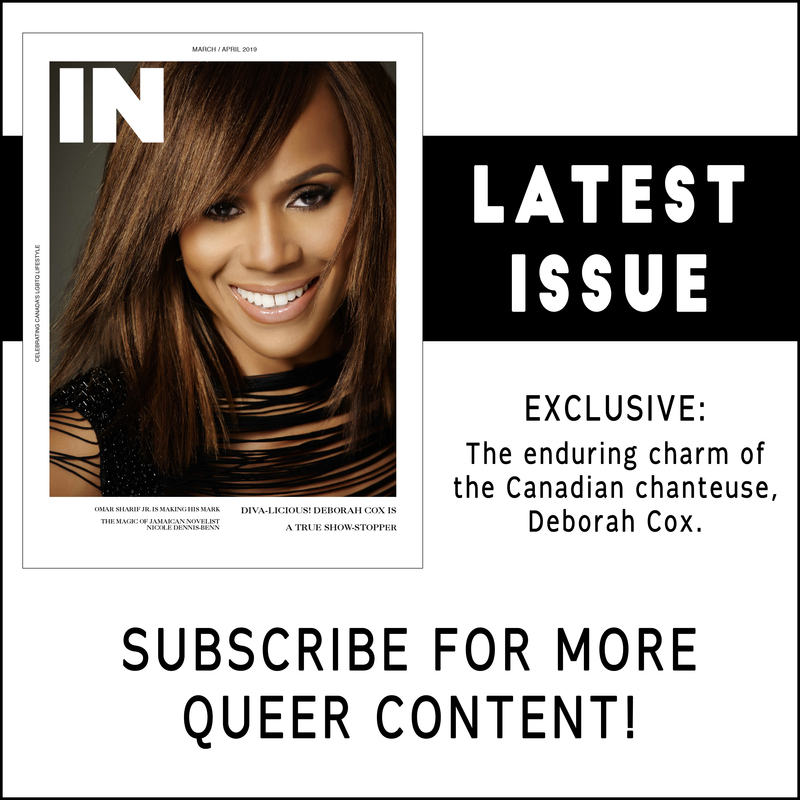 She’s the co-owner of Coco’s Cafe, in the small, picturesque mountain town of Jasper, Alta., and the driving force behind the founding of the Jasper Pride festival (jasperpride.ca). I’m here on a chilly March day to help celebrate this festival, now in its eighth year in the town. Jasper is a town of 5,000 people in the heart of the Rockies, nearly a four-hour drive from Edmonton, in a province stereotypically known for oil and cowboys. 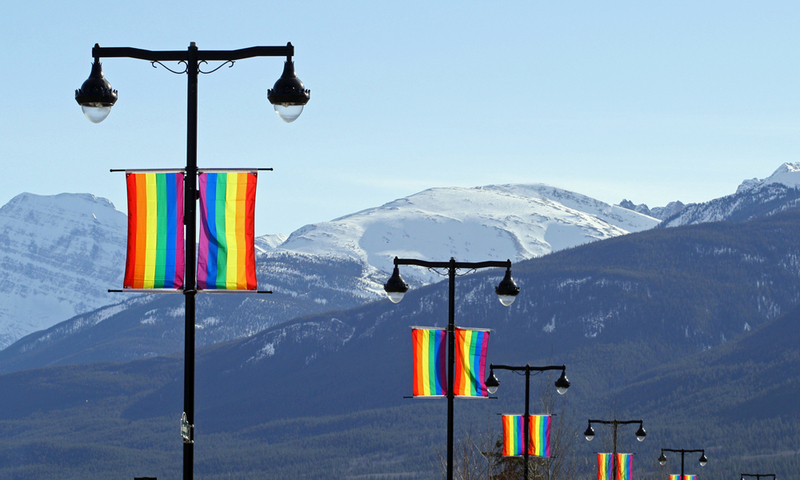 Yet Jasper defies rural clichés: the local high school has an active gay-straight alliance, the provincial legislature has three out MLAs, and—just a short block from Coco’s—nearly 100 rainbow flags run along the main street’s light poles in honour of Jasper Pride. Numerous businesses have decorated their windows in rainbow colours, including the Jasper Brewing Co., which has released a special Pride brew and lager. At 7:45 am, the tiny café, with its funky graffiti art, is hopping with those eager for a hearty and healthy breakfast (and coffee) before hitting the slopes or heading to work. It specializes in vegetarian, vegan and celiac-friendly fare, “with several meaty options for carnivorous folk.” I slurp back a fruit-and-yogurt smoothy, and gorge on the generously sized Groomer’s Breakfast, filled with eggs, meats and cheese. Wannop isn’t queer-identified but she’s an ally. After moving here, she recalls, “I went to Jordan Tucker [a local who has strong ties to the hospitality industry] and said, ‘We need Pride in Jasper,’ and he said, ‘Yes we do.’” The reception was overwhelmingly positive, though when she first put a rainbow flag on the door, it was ripped off, and there was one vocal opponent. The town’s first Pride festival was modest, with only 40 attendees at the main event. Wannop says: “There were more prizes than people.” Now the event lasts four days and draws about 1,000 people—that’s one-fifth the town’s entire population. Nature is a big draw for Pride attendees. That afternoon, I join a Sundog guided tour for an “ice walk.” As we drive by a herd of elk, talk of Pride gives way to an appreciation of the breathtaking landscape. Once at Maligne Canyon, we strap ice cleats onto our boots (both the boots and cleats are provided), and set off to explore what would be a riverbed in the summer. It’s hard to know where to look first: I take a slew of pics of frozen waterfalls, rock faces carved out by water flow, and giant frost formations created by warm, moist air escaping a network of caves. I feel like I’m in Narnia! Our guide teaches us about the foraging strategies of bears (the non-human kind), the importance of forest fires in ecosystem health, and the old-time prospector who suffered a slew of bad luck in the area—hence the canyon’s name, Maligne. That night, I peel off the layers of long johns and fleece in favour of a form-fitting T-shirt, and find out just how popular Jasper Pride has become. The evening events are packed. The burlesque show (featuring boys and girls) is standing room only, and at the Lumberjack party at the Whistle Stop Pub (its windows decorated with multi-coloured elk), organizers rush through the beard-judging contest. According to one drunken patron, it’s to make room for folks to move about. Fortunately, there’s still plenty of room on the slopes when we hit the hills the next day. The Alberta Rockies are best known for summer outdoor activities, so unlike some ski destinations, there are virtually no lineups at the lifts—even on weekends. The longest delay is the time it takes attendants to scan ski passes. At midday, dozens of skiers and snowboarders meet mid-hill, decked out in rainbow flags, bunny ears and animal onesies. Eight skiers lead us down the slopes, bearing a giant Pride flag. We’re met with cheers and bemusement from non-Pride attendees. I wrangle together the winners of the Canadian-themed costume contest, dressed respectively as a cow, a polar bear, a beaver…and a giraffe. The main event of the weekend is the Saturday night gala, hosted at the Fairmont’s four-star Jasper Park Lodge (JPL), a long-time sponsor of the event. I’m lucky to be staying on-site, in a beautiful lakeside suite. It’s just a few steps from the main lodge, with its heated outdoor pool and giant roaring fireplace, warming me when I lounge in the wingback chairs or dine in the Emerald Lounge. The Fairmont JPL is a $20 taxi ride from downtown, and a cab driver tells me the gala makes for his busiest night of the year, even better than New Year’s Eve. Attendees to the gala go all out with their outfits. This year’s theme is “Proud and Free,” in honour of the 150th anniversary of Canada’s confederation. Costumes range from red plaid to a woman in a slinky black dress with a faux-poutine bowl for a hat. “Part of what makes Jasper Pride special is that it draws a near equal number of men and women,” observes openly queer Alberta MLA Estefania Cortes-Vargas, who’s attending with her girlfriend. We are wowed by a runway show that is part burlesque, part cabaret, and full-on drag fabulous, followed by drunken dancing to pop hits, courtesy of DJ Thomas Culture. The next morning, I nurse my hangover, thankful for the giant omelette I ordered at the Fairmont JPL’s buffet breakfast, and a cappuccino to go. As I drive out of town, I look in the rearview mirror at the long row of rainbow flags stretching along the street, towards the snow-capped Rockies. When Toronto hosted World Pride, everyone went all out with pricey billboards, floats, and rainbow street crossings. It made me feel proud to be a Torontonian. But seeing those flags in a small Alberta town has an even greater effect. It makes me proud to be Canadian. To get more information on how to get the full winter Alberta experience, including where to eat, sleep and play click here! STEVEN BEREZNAI is a Toronto-based writer and bestselling author of How A Loser Like Me Survived the Zombie Apocalypse and I Want Superpowers. He can be reached through his website, stevenbereznai.com.